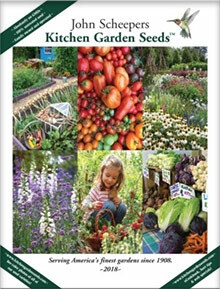 Gardeners will find the best seeds for vegetables, fruits, herbs and edible flowers in the KitchenGardenSeeds.com catalog. Grow a beautiful, productive kitchen garden to harvest and use in your favorite recipes for summer meals al fresco or special holiday menus. Vegetables - For vegetables seeds from A to Z, you can plan your kitchen garden around your favorite ingredients at KitchenGardenSeeds.com. Find garden seeds for sale to fill your vegetable beds with arugula, asparagus and eggplant, along with sprouting seeds, sweet peppers, Swiss chard and turnips. Make a list of your favorite salad greens, plan your garden and find the seeds right here, from escarole to dandelion and radicchio. Cultivate garden greens in every part of the country, and select the vegetable seeds that suit both your style of everyday cooking and your growing zone. Kitchen Garden Seeds has gardening tips that will help you plan and grow a garden that produces for your kitchen starting in summer until late into the Fall. Fruits - You will find seeds to grow your favorite fruit for cooking, like winter squash, tomatoes, tomatillos and cucumbers. Your garden will be a cook's paradise if you follow the Kitchen Garden Seeds tips for growing fruits as transplants, sowing garden seeds indoors, or direct sowing. Grow everyone's favorite fruits in your kitchen garden, from strawberries to rhubarb. They carry greenhouse varieties, exotic novelty seeds and many of the Asian specialties that your gourmet recipes call for you. If you can't find the ingredients you need at your local market, grow them with top quality seeds from KitchenGardenSeeds.com. Herbs - An herb garden is a great way to start growing your own food. Herb gardening is easy, doesn't take much space and produces edible plants quickly. You can grow herbs for many household uses, from natural dyes and soap making to herbal potions and tonics. You will love the selection at Kitchen Garden Seeds, with dill, lemongrass, sorrel, spearmint and all the Italian herbs you can make room for. An herb garden is a lovely contribution to the environment too. Herb flowers attract beneficial insects, bees, butterflies and hummingbirds, and they don't require chemicals fertilizers or pesticides to produce a healthy crop for use in your most aromatic dishes. Flowers - You will find all kinds of flower garden seeds for sale here, from bedding and vining varieties, to fragrant flowers, ornamental gourds and habitat gardens. Gourmet cooks will love the selection of edible flowers, with marigolds, nasturtiums, calendula and bachelor's buttons that add color, flavor and a nouvelle flair to your favorite recipes. Use them as ingredients or garnishes in special recipes and admire their beauty in your kitchen garden. Kitchen Garden Seeds also has helpful horticulture tips for beginning to expert gardeners and a tempting collection of recipes featuring garden fresh vegetables, herbs and fresh fruit. If you want to grow it and have it star in your favorite dishes, start your meal planning with the best garden seeds for sale.